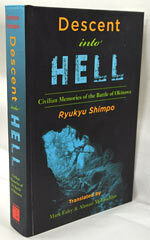 Descent into Hell: Civilian Memories of the Battle of Okinawa published by Merwin Asia Publishing Co. The book is an English translation of the Japanese version, which was published as a series of articles titled, Senka o Horu (Trans: Digging up the Ravages of War) in Ryukyu Shimpo. The Ryukyu Shimpo published a series of articles titled, Senka o Horu (Trans: Digging up the Ravages of War) between August 1983 and April 1985. An English translation of the article series has been published as a book in the United States, under a new title of Descent into Hell: Civilian Memories of the Battle of Okinawa. New Zealand researcher Mark Ealey and Alastair McLauchlan translated the articles for the book, published by Merwin Asia Publishing Co.
Ealey, who initiated the English translation of Senka o Horu, said, “I want readers who live in English-speaking countries and those who read in English to understand the misery of the war. Noncombatant people become the worst victims of war. The military was only concerned about itself. During the Battle of Okinawa, the Imperial Japanese Army sacrificed the Okinawan people in order to protect the main islands of Japan. Readers will have an opportunity to learn about the history of Okinawa.” He also wants young people with ties to Okinawa, who were born and raised abroad and cannot speak Japanese, to read this book. Ealey is the translator of Rikugun nitohei Higa Shinichi (Typhoon of Steel, An Okinawan Schoolboy’s Quest for Martyrdom in the Battle of Okinawa) written by Japanese novelist Akira Yoshimura. The novelist depicts the Battle of Okinawa through the eyes of a student who is sent to the battlefield. Ealey came across Senka o Horu, published in the Ryukyu Shimpo, when he translated Junkoku into English. He offered to translate the articles into English and publish them in the United States. He has spent four years working to translate and publish the book. Looking back on the translation work, he said, “I felt more deeply the misery of the Battle of Okinawa, especially for the residents. I felt anger towards the Japanese Imperial Army, which treated the Okinawan people cruelly, including forcing mass suicide.” The title of the book Descent into Hell means that Okinawan people were trapped in hell. His close friend and co-translator McLauchlan, Academic Program Leader at the Maori University, died without seeing this book. “I am so sad that I could not have published this book while he was alive,” Ealey said. He will visit Okinawa and tour the battle sites this month. He was initially scheduled to visit Okinawa with the co-translator.